Phnom Penh (VNA) – Head of Vietnam’s Government Committee for Religious Affairs Vu Chien Thang said he wishes that the Cambodian Ministry of Cults and Religion would create favourable conditions for overseas Vietnamese following Buddhism and Caodaism in the country to join religious activities. Cambodia is now home to more than 5,000 pagodas and 700,000 Buddhist followers. The most popular religions in the country are Buddhism, Islamism, Catholicism, and nine smaller religions, including Caodaism and Hoa Hao Buddhism, he said, stating that the Cambodian government hopes that all religions can live in peace together. 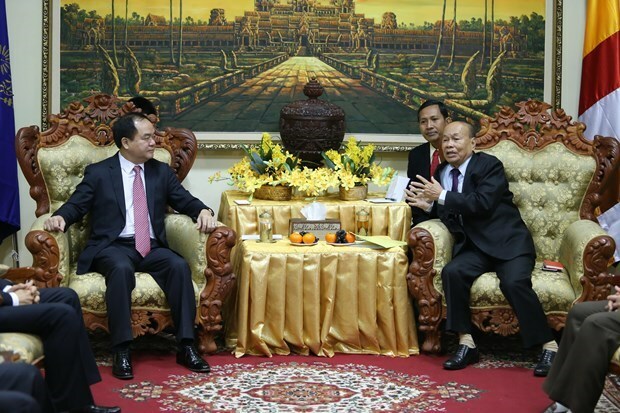 Thang informed his host about major religious activities in Vietnam over the years, saying that the Vietnamese Government assists the work of religions in holding events to promote people-to-people and cultural diplomacy. Religious institutions in Vietnam have been making increasingly positive contributions to national construction and defence, he said, adding that there are 16 active religions working in 43 organisations, with 24 million followers – accounting for one third of the total population, nearly 30,000 places of worship, and 14 religious training establishments. During a visit to the Vatican in September 2018, permanent Deputy Prime Minister Truong Hoa Binh held a working session with Pope Francis. Both sides upheld the spirit of dialogue between religions and states and agreed to upgrade bilateral diplomatic ties from the level of non-resident envoy to resident envoy in the near future. Thang briefed the host about the outcomes of a meeting on promoting religious cooperation between Vietnamese and Cambodian provinces sharing the border in 2018.